Previously we explored the business case for consistency by considering the influence of poor experiences. The modern customer experience environment is constituted of an ever expanding variety of delivery channels, with no evidence of the slowing of the pace of channel expansion. As channel expansion continues, customer empowerment is increasing with customer choice. Customer relationships with brands are not derived from individuals’ discrete interactions. Rather, customer relationships are defined by clusters of interactions, clusters of interactions across the entire life cycle of the relationships, and across all channels. Inter-channel consistency defines the customer relationship. McKinsey and Company concluded in their 2014 report, The Three Cs of Customer Satisfaction: Consistency, Consistency, Consistency, demonstrated, in a retail banking context, a link between cross-channel consistency and bank performance. In customers’ minds, all channels belong to the same brand. Customers do not consider management silos or organizational charts – to them all channels are the same. Customers expect consistent experiences regardless of channel. In their minds, an agent at a call center should have the same information and training as in-person agents. What are the implications for managers of the customer experience? The primary management issue in aligning disparate channels is to manage inconsistency at its cause. The most common cause of inconsistencies across channels is the result of siloed management, where managers’ jurisdiction is limited to their channel. Inter-channel consistency is increasingly important as advances in technology expand customer choice. Brands need to serve customers in the channel of their choice. Therefore, the cause of inter-channel inconsistency must be managed higher up in the organization at the lowest level where lines of authority across channels converge, or through some kind of cross-functional authority. The implications for management are not limited to senior management and cross-functional teams. Customer experience managers should be aware that top-line averages can mislead. Improvement opportunities are rarely found in top-line averages, but at the local level. Again, the key is to manage inconsistency at the cause. Inconsistency at the local level almost always has a local cause; as a result, variability in performance must be managed at the local level as well. In a previous post from 2014, we discussed aligning cross channel service behaviors and attributes. In the next blog post in this series, we will explore intra-channel consistency. In earlier posts we discussed the business case for consistency, primarily because consistency drives customer loyalty and the causal chain from consistency to customer loyalty. This post continues to explore the business case for consistency by considering the influence of poor experiences. 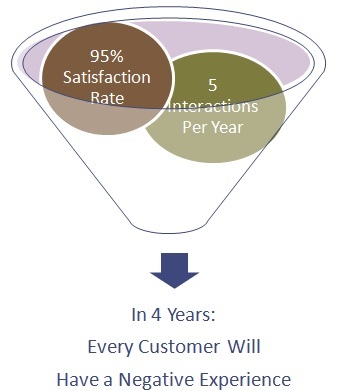 Assume a brand’s typical customer has 5 service interactions per year. Also assume, the brand has a relatively strong 95% satisfaction rate. Given these assumptions, the typical customer has a 25% probability each year of having a negative experience, and in four years, in theory, every customer will have a negative experience. As this case study illustrates, customer relationships with brands are not defined by individual, discrete customer experiences but by clusters of interactions across the lifecycle of the customer relationship. The influence of individual experiences is far less important than the cumulative effect of these clusters of customer experiences. Consistency reduces the likelihood of negative experiences contaminating the clusters of experiences which make up the whole of the customer relationship. 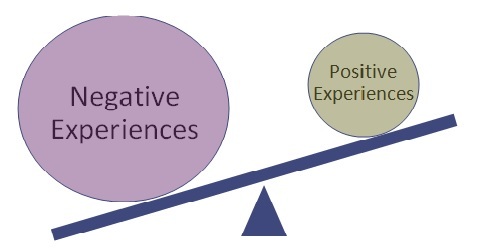 Negative experiences, regardless of how infrequent, have a particularly caustic effect on the customer relationship. A variety of research, including McKiney’s The Three Cs of Customer Satisfaction: Consistency, Consistency, Consistency, has concluded that negative experiences have three to four times the influence on the customer as positive experiences – three to four times the influence on the customer’s emotional reaction to the brand – three to four times the influence on loyalty, purchase intent and social sharing within their network. In our next post we will discuss inter-channel consistency. In an earlier post we discussed the business case for consistency, primarily because consistency drives customer loyalty. This post describes the causal chain from consistency to customer loyalty. Brands are defined by how customers experience them, and they will have both an emotional and behavioral reaction to what they experience. It is these reactions to the customer experience which drive satisfaction, loyalty and profitability. There is a causal chain from consistency to customer loyalty. McKinsey and Company concluded in their 2014 report, The Three Cs of Customer Satisfaction: Consistency, Consistency, Consistency, that feelings of trust are the strongest drivers of customer satisfaction and loyalty, and consistency is central to building customer trust. For example, in our experience in the banking industry, institutions in the top quartile of consistent delivery are 30% more likely to be trusted by their customers compared to the bottom quartile. Furthermore, agreement with the statements: my bank is “a brand I feel close to” and “a brand that I can trust” are significant drivers of brand differentiation as a result of the customer experience. Again, brands are defined by how customers experience them. In today’s environment where consumer trust in financial institutions is extremely low, fostering trust is critical for driving customer loyalty. Consistency fosters trust. Trust drives loyalty. In our next post we will continue to explore the business case for consistency by considering the influence of poor experiences. In a previous post we considered why humans value consistency. Loyalty is the holy grail of managing the customer experience. The foundation of customer loyalty is consistency. In a 2014 research paper entitled, The Three Cs of Customer Satisfaction: Consistency, Consistency, Consistency, McKinsey & Company concluded that trust, trust driven by consistent experiences, is the strongest drivers of customer loyalty and satisfaction. Kinēsis, believes that each time a brand and a customer interact, the customer learns something about the brand, and they adjust their behavior based on what they learn. There is real power in understanding this proposition. In it is the power to influence the customer into profitable behaviors and away from unprofitable behaviors. One of these behaviors is repeat purchases or loyalty. Customer loyalty takes time to build. Feelings of security and confidence in a brand are built up by consistent customer experiences over a sustained period of time. Across all industries, customers want a good, consistent experience with the products and services they use. 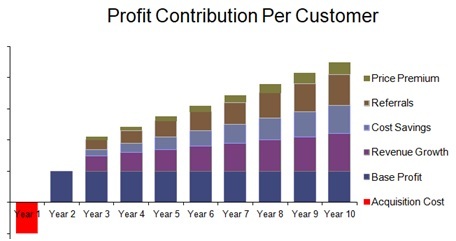 This curve of profit contribution per customer over time is called the loyalty curve. At customer acquisition, the profit contribution is initially negative as a result of the cost of customer acquisition. After acquisition, customer profit contribution increase with time as a result of revenue growth, cost savings, referrals and price premiums. Loyal customers and consistent customer experiences require less customer education, generate fewer complaints, reduce the number of phone calls, handle time and are more efficient across the board. In the next post we will explore the causal chain from consistency to customer loyalty. Humans value consistency – we are hard wired to do so – it’s in our DNA. It is generally believed that modern humans originated on the Savanna Plain. Life was difficult for our distant forefathers. Sources of water, food, shelter were unreliable. Dangers existed at every turn. Evolving in this unreliable and hostile environment, evolutionary forces selected in modern humans a value for consistency – in effect hard wiring us to value consistency. We seek security in an insecure world. In this context, it is not surprising we evolved to value consistency. While our modern world is a far more reliable environment, our brains are still hard wired to value consistency. The implication for managers of the customer experience is obvious – customers want and value consistency in the customer experience. We’ve all felt it. When a car fails to start, when the power goes out, when software crashes we all feel uncomfortable. A lack of reliability and consistency creates confusion and frustration. We want to have confidence that reliable events like starting the car, turning on the lights or using software will work consistently. In the customer experience realm, we want to have confidence that the brands we have relationships with will deliver consistently on their brand promise each time without variation in quality. Customers expect consistent delivery on the brand promise. They base their expectations on prior experience. Thus customers are in a self-reinforcing cycle where expectations are set based on prior experiences continually reinforcing the importance of consistency. This is the foundation of customer loyalty. We are creates of habit. The foundation of customer loyalty is built on the foundation of dependable, consistent, quality service delivery. While we evolved in a difficult and unreliable environment, our modern society is much more reliable. Our modern society offers a much more consistent existent. Again, it’s a self-reinforcing cycle. Product quality and consistency of our mass production economy has reinforced our expectations of consistency. Today’s information technology continues to reinforce our desire for consistency. However, it adds an additional element of customization. Henry Ford, the father of mass production, famously said of the Model-T, “You can have any color you want as long as it’s black.” Those days are gone. Today, we expect both consistency and customization. In the next post, we will explore the business case for consistency. What impresses customers positively as a result of a call to your call center? To answer this question, Kinesis conducted research into the efficacy of the bank contact center sales process by observing a battery of sales and service behaviors through the use of mystery shoppers. The objective of this study was to identify which sales and service behaviors drive purchase intent. (See the insert below for a description of the methodology). The table at the end of this post shows the relative frequency in which each behavior was observed in shops where the shopper reported positive purchase intent as a result of the call, compared to shops with negative purchase intent. Each of these behaviors is at least three times more likely to be present in shops with positive purchase intent compared to those with negative purchase intent. First, integration of other channels into the sales process appears to drive purchase intent. Inviting the shopper to visit a branch was observed 6.4 times more frequently in shops with positive purchase intent compared to negative. The branch still has a role in the sales process; other research consistently points to the convenience of branch location as a driver of selection of a primary financial institution. If contact centers leverage the branch during the sales process, they have a significantly better chance to advance the sale. Additionally, when the agent incorporated the website into the sales presentation, they also have a better chance of advancing the sale. Mentioning the website was 3.3 times more likely to be present in shops with positive purchase intent compared to negative. Secondly, the balance of these key behaviors all revolve around personal attention (thank for waiting on hold, offing further assistance, listening attentively, offer to send material) and interest in the customer’s business (express appreciation or thank for business). The themes most common in this second group of behaviors that appear to influence purchase intent are competence (product knowledge, easy to understand explanations), personal attention (asking name, checking back on hold, probing of needs) and interest in the customer’s business (ask for business, express value, thank for calling). So…what drives purchase intent as a result of a call to a contact center? Integrating other channels into the conversation, and sincerely expressing interest in the customer broadly drive purchase intent. 1) Define the sales process among different institutions. 2) Evaluate the effectiveness of specific sales behaviors. Shoppers were asked a mixture of closed-ended questions to evaluate the presence or frequency of specific behaviors, and open-ended questions to gather the qualitative impressions of these behaviors on the shoppers – in short the how and why behind how the shopper felt. Finally, to provide a basis to evaluate the effectiveness of each sales behavior, shoppers were asked to rate their purchase intent as a result of the visit. This purchase intent rating was then used as a means of evaluating what behaviors tend to be present when positive purchase intent is reported as opposed to negative purchase intent. Customers do not care nor understand why the experience of interacting with an organization through one channel is different than another. Be it via in-person, contact center, chat, or website, customers expect a seamless and consistent experience. Cross-channel alignment presents managers with a series of complex issues. This post focuses on the issue of sales and service behaviors, and outlines a methodology to align channels into a consistent set of cross channel behaviors. It should go without saying that the first step in aligning sales and service behaviors across channels it to define the elements of the experience for the entire organization. This sounds fairly obvious, but I’m always surprised by how many clients do not have agreed upon cross channel customer experience requirements. Starting at the beginning, the first step is to define the customer experience in terms of dimensions or attributes which make up the desired experience. The next step in building a consistent set of behaviors across all channels is to define each of the desired service dimensions in terms of attributes, which support each dimension. In keeping with the above example, a financial institution may define each dimension in terms of the following set of attributes. Once each dimension is defined in terms of specific attributes, the next step is to identify specific behaviors for each channel that support each attribute. 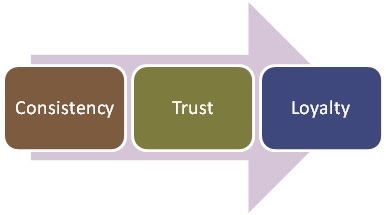 Keeping with the above example, the financial institution may decide that establishing trust is made up of a set of five behaviors mapped across each channel. 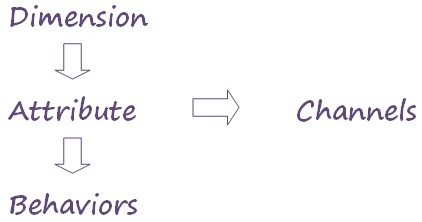 Note this behavioral map assigns behaviors based on their appropriateness to each channel. So, for example, while the in-personal channel may be expected to maintain eye contact, obviously that would not apply for the contact center. Or the in-person channel may be expected to maintain a smile, while for the contact center this behavior may be modified for the phone channel to sounding as if they are smiling through the phone. Key to maintaining consistent behaviors across channels is monitoring the experience. The two most common methodologies to monitor cross channel alignment are post-transaction surveys and mystery shopping. How customers feel about the organization, and the extent to which each service dimension and attribute is perceived within the customer’s mind are best measured with post-transaction surveys of customers. Measuring specific behaviors is best performed with mystery shoppers, where specially trained researchers observe the presence of each behavior using predetermined scenarios.